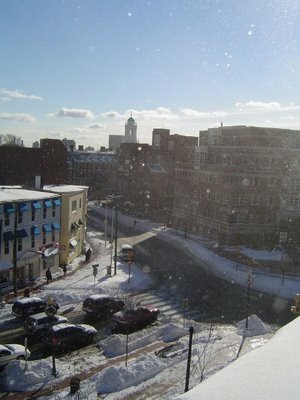 As I've mentioned, on more than one occasion I'm sure, I am NOT a fan of winter (pic on left is a couple of winters ago in Cambridge, MA), and a major reason for the move here was to escape the winters in Boston. Now that we are heading into our second winter here, I found myself paying closer attention to how the seasons change. Last year was such a novelty - 65 degree days in November, and winter nights where it rarely got below 50. I have been noticing the changing trees, the different flowers and foliage, and other changes more so than before...and with the nasty weather some parts of the country, such as Seattle, have been experiencing I am even happier to have escaped snow, ice and cold. I know we will need to occasionally turn on the heat, if only to take the chill out of the air, and we are now starting to have dinner in front of the fire. So despite the claims of some friends and family back East, we DO have a change of seasons. Yesterday we had our first heavy rain, after months of none, so the rainy season must be upon us. The air feels different, the sunrises and sunsets have changed, with more clouds, and the shorter days all combine to remind me of winter, but a much more pleasant (i.e., tolerable) than back East. I guess I still have a fascination for watching the weather reports of snowstorms and other wintry weather elsewhere...probably because I escaped, and it makes me appreciate our weather here that much more. Do I have regrets? Nope. Anytime I want to see "winter" I just check out the weather station - that's enough for me. We just received the post card reminder from the place in Fallbrook where we bought our first California Christmas tree last year - guess we need to start thinking along those lines again. Since my family and I celebrate Christmas, we have always had a tree in the house (and sometimes 2). We have bought live trees for many years, and part of the family tradition has always been a jaunt to the tree farm to select the right tree and cut it down (in some cases we go early to tag it, then return a couple weeks before the holiday to do the cutting). We actually haven't bought a cut tree off a lot for more years than I can remember - there's something about the smell, the fact that the tree keeps its needles, and the tradition we started when the kids were very young. Cutting down our first California tree was an interesting experience. We wondered what kinds of trees would there be (coming from New England, where there are evergreens everywhere, you have a very wide selection of tree types, sizes, and shapes)? Would we still be able to cut our own? How far would we have to go? We located a tree farm in Fallbrook (Mission Pine Christmas Tree Farm, at 4062 Mission) and ended up there in early December last year to cut the tree down. What an odd experience - cutting down a Christmas tree in 70 degree weather in shorts and sandals! And they were playing "Santa Baby" over the loudspeaker to get us in the mood!Typically we went tree cutting when it was in the 30s or so in New England (that was part of the fun, at least so my wife said), often with snow coming down, or cold rain. Having wanted to be in CA anyhow, and loving warm weather, I was in my glory - but it was an odd feeling nonetheless. My wife and I laughed about the other experiences we had with three cutting...the coldest was when we lived in Minnesota and visited the local tree farm to cut our tree when it was 29 degrees BELOW ZERO. Man, you just can't imagine that kind of cold unless you have been there!! Needless to say I am looking for to our tree cutting venture again...when it is WARM!! And I don't mind sweating a bit, either. I hope everyone had a great holiday and did not overindulge TOO much. Yesterday started the offical holiday shopping season, since today is Black Friday and many stores started their campaign to rid consumers of as much money as possible in the next 4 weeks late last night. Last night was historic for me. Not one for shppoing in malls (I do most of mine on-line, with an occassional foray into certain stores), I stoically avoid the Black Friday madness, and shopping in general until about a week before the holiday. My daughter is visiting from LA and wanted to buy a new laptop, so the options on getting a GREAT deal were at CompUSA LAST NIGHT from 9 - midnight, and early this morning (5 AM!!) at Best Buy. For some reason I agreed that I would go along even though I was not planning to buy anything. We opted for CompUSA since it is less than 10 minutes from the house, and 9 PM sounded SOOOO much better than 5 AM. We got to the store about 8:55 PM - there was already a line of about 150 people!! The line moved fairly quickly until they were filled, then they let new people in as successful shoppers emerged. It took 20 minutes to get inside, and we fairly quickly were able to get the paperwork for the laptop my daugher wanted (fortunately it was not yet sold out, but other buyers were not so lucky). The checkout line was another 45 minutes, but we emerged with a new laptop at a good price with a rebate of about $400 (total cost about 60% of retail). She was pleased and we went home and had dessert. Would I do it again...hmmm, not sure. As a first experience, and with our success, I guess it felt worthwhile, but I can't see doing that again. And now they (my wife and daughter) are out on Black Friday with the masses - I'm here working and enjoying the peace and quiet. As readers know, we are new to the area, so we are still in the process of discovering art galleries and museums to visit and enjoy in San Diego. A favorite pastime, when we have the time, is visiting local galleries and museums, as well as when we travel. Over time our tastes have evolved and we now tend to prefer modern and abstract art. We were in San Francisco a couple of weeks ago and took some time to visit the Musuem of Modern Art (MOMA), which was terrific - it is well worth the visit if you enjoy contemporary art and are in town. We are in LA fairly regularly (maybe 2 hours drive from Carlsbad unless you go at rush hour), which has a great collection of galleries and museums (as you may already know). A good place to shop for mostly contemporary art at reasonable prices (well, for the most part, but you can also buy Sam Francis, Helen Frankenthaler and Motherwell, so 5 figures is not unreasonable) is at Bergamot Station in Santa Monica, a collection of warehouses offering more than 20 galleries with a broad range of artists, mediums and prices. Lots of galleries on La Brea, Melrose, and Wilshire, among other major shopping streets. We also get to Laguna Beach occasionally, which has a terrific annual art fair, as well as a good variety of galleries. In San Diego we have discovered a great gallery in the Cedros District of Solana Beach called Galerie d'Art International, which suits our taste in abstract and contemporary art with an international flare. La Jolla offers a good number of galleries, although most, from what I have seen, is representational/realism and similar to what you find in Laguna Beach and other higher-end tourist destinations. We have yet to get to the galleries in Escondido, which has a very active art association and the California Center for the Arts. We still have lots to discover, and I would love to hear from other art lovers about favorite galleries and museums in the San Diego area. What are the "must see" places you would recommend to visitors? There was another recent article published in the Union-Tribune regarding our housing market. Overall, this was a fairly positive article summarizing some encouraging changes in the market statistics (e.g., a drop in inventory and an overall rise in the median home price). Nothing especially dramatic, but the changes do suggest the correction may be nearing the end and a period of stability will follow. I track the stats myself for the towns I service and inventory is dropping (with 7-8 month inventory in many towns, except the high-end areas like Rancho Santa Fe).The interest rates are great right now, as well, which is likely helping to increase sales activity. Of course we are now entering the holiday season which typically shows a slowing of activity anyhow, as people are involved with other activities (unless they NEED to buy). Stay tuned for more updates on the housing market as it evolves. California certainly has a reputation for having lots of tract housing (although you can find such developments all over the country, typically in the suburbs, e.g., Las Vegas, Phoenix, Florida), and we have our share here in San Diego. I have my own home-grown idea of what tract housing is, but Wikipedia defines it as "a style of housing development in which multiple identical, or nearly-identical, homes are built to create a community. Tract housing may encompass dozens of square miles of areas." Tract housing, in general, has a bad reputation, perhaps stemming from the poorer quality, cookie-cutter homes that were constructed seemingly overnight in many areas after the war, primarily for veterans and their families. To be sure, many homes ARE identical, or very close, and the quality from some builders is suspect (so do you due diligence and check out the builders first). A trademark of this type of housing today is that there typically are only a few different models in a subdivision (of the ones I've seen, as few as 3 floor plans and as many as 12). One objection people have raised in the past is that they all look alike, and builders have responded to this by creating many different options for roofing, windows, exterior paints and materials (stone, brick, etc), landscaping, etc. While the general look is similar, each home has a unique look and feel. And early buyers can generally customize their homes, inside and out, with upgrade options offered by the developer. People often have the impression that tract housing is cheap - a remnant from the past. While this was true of tract housing (and perhaps in some parts of the country is still the case), here in our area there are homes that can run into the high 6 figures and beyond. Quality of construction has vastly improved as well, with new technology and mass production, and the competition. Is this style of home right for you? Well, it depends. But there are many reasons in this market to consider it - buyer incentives (e.g., upgrades), the fact that the housing is brand new, opportunity to customize, among others. If you are shopping for a home, I would at least consider some of the many new developments in the area. One of the things I have enjoyed about being here in California is the ability to go out and ride my bike virtually year-round. I'm ashamed to admit I am a bit of a fair-weather rider, and in Boston there seemed to be more bad weather (wind, cold, snow, heavy rain) than good for riding...at least it was always a good excuse to not go out and ride, but instead to get my exercise on a spinning bike 5-6 times a week. I love riding out here (I am a road biker, not a mountain biker) and the terrain provides lots of opportunity for speed as well as hill climbing. There really isn't much flat road where I am so the workout is better than what I typically got on the bike trails in the Boston area. I especially enjoy riding the coast from Oceanside down to Del Mar and back. California does a much better job of providing bike lanes, and despite the traffic it seems to be fairly safe. Anyone with recommendations about great places to ride out here? Favorite bike shops? Finding housing in the San Diego area is a challenge due to the high prices, and even rental housing can be difficult as rents continue to rise with the slow down in the housing market. Bridge Housing is one of California's largest builders of affordable housing, primarily rentals but which includes some low income homes for purchase. The apartments are offered at afforable rents due to being funded with a federally regulated government program called Low Income Housing Tax Credit Program (LIHTC). Apartment complexes built by Bridge Housing in the San Diego area that meet the guidelines for LIHTC include Villa Loma Apartments in Carlsbad (760-929-7555), Torrey Del Mar Apartments in San Diego (858-780-8760), Poinsettia Station Apartments in Carlsbad (760-438-8839), Dove Canyon Apartments in San Diego (760-521-0787), Terra Cotta Apartments in San Marcos (760-471-6151), and Copper Creek Apartments in San Marcos (760-510-0210). In recent years my wife and I have enjoyed going to spas when traveling (typically a hotel spa) or for special occasions (birthdays, anniversary, celebrations). I have confined myself to massages and an occasional facial, but there are lots of options (more than you can reasonably consider, I think) depending on your preferences...and wallet. Costs vary, depending on where you go and what you have done, but you can count on spending a fair amount of money plus gratuity. And if you go to a spa for several days or a week the costs can really add up (thousands of dollars). Overall, I consider a few hours at a day spa to be well worth the money, given the sense of well-being and relaxation, and simply treating ourselves when work becomes too stressful or to celebrate a birthday or anniversary is a nice reward. The Spa at the Four Seasons in Carlsbad is terrific, having been there at least 4 times now since we moved here last year. While we live right by La Costa Spa and Resort we have not yet gone, but I have heard great things about their spa, as well as about the Chopra Center. The Spa at Torrey Pines, La Valencia and Estancia (all in La Jolla) also come highly recommended. Perhaps you know of others that you like, or have had an experience you would like to share? For more information about the many spas in the San Diego area, check out this site. Looking for a more exotic locale? Visit Leading Spas of the World. I am a big seafood fan...and coming from New England, that is probably not a surprise to anyone who has lived or visited there. Boston is known for its seafood and clam chowder. I have found the seafood here in California to be excellent as well. While there are some different fish to enjoy (a good thing), the overall variety and quality has been excellent. Being a big tuna fan, I am always drawn to the Ahi on the menu when out for lunch or dinner (the tuna back east is generally blue fin), and is a favorite of mine for grilling. You might guess that I also am a big sushi fan - not hard to find that here, either, but you can find a pretty broad quality. Finding good seafood to buy has not been a big problem, although you have to watch where you are buying it and when. The grocery stores in the area (Vons, Albertsons) have decent choices, although sometimes getting good FRESH seafood is tough at certain times of the week, and the prices can be steep. And there are often big differences between different stores (e.g., the Vons at La Costa Avenue is one we stay away from...period). The fish counter at Stater Brothers is good, as is the one at Jimbo's in Carlsbad and at Henry's in Encinitas. The overall quality seems better, with more choices, although sometimes the prices are a little higher, but well worth it. The best place we have found for fresh seafood is at Fish House Vera Cruz in Carlsbad (they also have a store/restaurant in San Marcos and one in Temecula). There is a good family style seafood restaurant there - no frills, but good simply-prepared fish - but their seafood counter is terrific. Huge selection, with lots of unique fish you don't often find elsewhere (tombo, yellowtail, ono, among others whoses names I can't recall) and their prices are the best. Any great places you have found we should know about?